Who a former judge later associates with and what he subsequently does or says will still be closely scrutinised by the public. THE morning after I retired, a Rolls Royce arrived at my house with a message that I was required to attend a very important board meeting. Without further ceremony, I was taken to the penthouse of the Chartered Bank. Here, I was appointed chairman and required to call the meeting to order. Those were the bantering words of one of Malaysia’s most celebrated judges, Tun Mohamed Suffian, at a dinner given in his honour shortly after his retirement as Lord President on Nov 12, 1982. At first glance, these may well be facetious remarks, but it does go to show that a retired judge can be commercially marketable and become an asset for any organisation to be associated with. 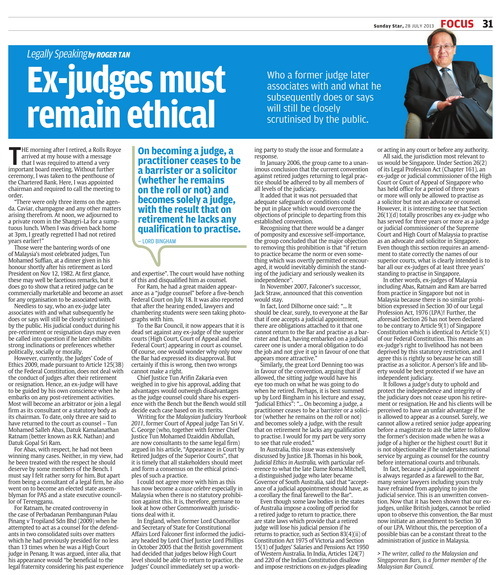 Needless to say, who an ex-judge later associates with and what subsequently he does or says will still be closely scrutinised by the public. His judicial conduct during his pre-retirement or resignation days may even be called into question if he later exhibits strong inclinations or preferences whether politically, socially or morally. However, currently, the Judges’ Code of Ethics 2009, made pursuant to Article 125(3B) of the Federal Constitution, does not deal with the conduct of judges after their retirement or resignation. Hence, an ex-judge will have to be guided by his own conscience when he embarks on any post-retirement activities. Most of them will become an arbitrator or join a legal firm as its consultant or a statutory body as its chairman. To date, only three are said to have returned to the court as counsel – Tun Mohamed Salleh Abas, Datuk Kamalanathan Ratnam (better known as R.K. Nathan) and Datuk Gopal Sri Ram. For Abas, with respect, he had not been winning many cases. Neither, in my view, had he been treated with the respect he should deserve by some members of the Bench. I must say I felt rather sorry for him. But apart from being a consultant of a legal firm, he also went on to become an elected state assemblyman for PAS and a state executive councillor of Terengganu. For Ratnam, he created controversy in the case of Perbadanan Pembangunan Pulau Pinang v Tropiland Sdn Bhd (2009) when he attempted to act as a counsel for the defendants in two consolidated suits over matters which he had previously presided for no less than 13 times when he was a High Court judge in Penang. It was argued, inter alia, that his appearance would “be beneficial to the legal fraternity considering his past experience and expertise”. The court would have nothing of this and disqualified him as counsel. For Ram, he had a great maiden appearance as a “judge counsel” before a five-bench Federal Court on July 18. It was also reported that after the hearing ended, lawyers and chambering students were seen taking photographs with him. To the Bar Council, it now appears that it is dead set against any ex-judge of the superior courts (High Court, Court of Appeal and the Federal Court) appearing in court as counsel. Of course, one would wonder why only now the Bar had expressed its disapproval. But certainly if this is wrong, then two wrongs cannot make a right. Chief Justice Tun Arifin Zakaria even weighed in to give his approval, adding that advantages would outweigh disadvantages as the judge counsel could share his experience with the Bench but the Bench would still decide each case based on its merits. Writing for the Malaysian Judiciary Yearbook 2011, former Court of Appeal judge Tan Sri V. C. George (who, together with former Chief Justice Tun Mohamed Dzaiddin Abdullah, are now consultants to the same legal firm) argued in his article, “Appearance in Court by Retired Judges of the Superior Courts”, that it is timely that all stakeholders should meet and form a consensus on the ethical principles of such a practice. I could not agree more with him as this has now become a cause celebre especially in Malaysia when there is no statutory prohibition against this. It is, therefore, germane to look at how other Commonwealth jurisdictions deal with it. In England, when former Lord Chancellor and Secretary of State for Constitutional Affairs Lord Falconer first informed the judiciary headed by Lord Chief Justice Lord Phillips in October 2005 that the British government had decided that judges below High Court level should be able to return to practice, the Judges’ Council immediately set up a working party to study the issue and formulate a response. In January 2006, the group came to a unanimous conclusion that the current convention against retired judges returning to legal practice should be adhered to by all members of all levels of the judiciary. It added that it was not persuaded that adequate safeguards or conditions could be put in place which would overcome the objections of principle to departing from this established convention. Recognising that there would be a danger of pomposity and excessive self-importance, the group concluded that the major objection to removing this prohibition is that “if return to practice became the norm or even something which was overtly permitted or encouraged, it would inevitably diminish the standing of the judiciary and seriously weaken its independence”. In November 2007, Falconer’s successor, Jack Straw, announced that this convention would stay. In Australia, this issue was extensively discussed by Justice J.B. Thomas in his book, Judicial Ethics in Australia, with particular reference to what the late Dame Roma Mitchell, a distinguished judge who later became Governor of South Australia, said that “acceptance of a judicial appointment should have, as a corollary the final farewell to the Bar”. Even though some law bodies in the states of Australia impose a cooling off period for a retired judge to return to practice, there are state laws which provide that a retired judge will lose his judicial pension if he returns to practice, such as Section 83(4)(ii) of Constitution Act 1975 of Victoria and Section 15(1) of Judges’ Salaries and Pensions Act 1950 of Western Australia. In India, Articles 124(7) and 220 of the Indian Constitution disallow and impose restrictions on ex-judges pleading or acting in any court or before any authority. All said, the jurisdiction most relevant to us would be Singapore. Under Section 26(2) of its Legal Profession Act (Chapter 161), an ex-judge or judicial commissioner of the High Court or Court of Appeal of Singapore who has held office for a period of three years or more will only be allowed to practise as a solicitor but not an advocate or counsel. However, it is interesting to see that Section 26(1)(d) totally proscribes any ex-judge who has served for three years or more as a judge or judicial commissioner of the Supreme Court and High Court of Malaysia to practise as an advocate and solicitor in Singapore. Even though this section requires an amendment to state correctly the names of our superior courts, what is clearly intended is to bar all our ex-judges of at least three years’ standing to practise in Singapore. In other words, ex-judges of Malaysia including Abas, Ratnam and Ram are barred from practice in Singapore but not in Malaysia because there is no similar prohibition expressed in Section 30 of our Legal Profession Act, 1976 (LPA)! Further, the aforesaid Section 26 has not been declared to be contrary to Article 9(1) of Singapore Constitution which is identical to Article 5(1) of our Federal Constitution. This means an ex-judge’s right to livelihood has not been deprived by this statutory restriction, and I agree this is rightly so because he can still practise as a solicitor. A person’s life and liberty would be best protected if we have an independent judiciary. It follows a judge’s duty to uphold and protect the independence and integrity of the judiciary does not cease upon his retirement or resignation. He and his clients will be perceived to have an unfair advantage if he is allowed to appear as a counsel. Surely, we cannot allow a retired senior judge appearing before a magistrate to ask the latter to follow the former’s decision made when he was a judge of a higher or the highest court! But it is not objectionable if he undertakes national service by arguing as counsel for the country before international courts and tribunals. In fact, because a judicial appointment is always regarded as a farewell to the Bar, many senior lawyers including yours truly have refrained from applying to join the judicial service. This is an unwritten convention. Now that it has been shown that our ex-judges, unlike British judges, cannot be relied upon to observe this convention, the Bar must now initiate an amendment to Section 30 of our LPA. Without this, the perception of a possible bias can be a constant threat to the administration of justice in Malaysia. The writer, called to the Malaysian and Singaporean Bars, is a former member of the Malaysian Bar Council.